Last Monday, we joined Ansley Davies, Associate Curator for the LA County Department of Parks & Recreation, at a local rock art site with both painted and carved elements in order to carry out a photographic technique called reflective transformation imaging (RTI). The rock art elements are at risk of vanishing because they were painted on and inscribed into massive sandstone rocks, the surface of which is easily destroyed by particles carried by wind, rainfall, movement by animals, and lichens, which are growths on rock made up in part by algae and part by fungus. Vandalism by visitors also places the rock art at risk. The goal of the project then was to start creating a photographic record of each of the elements so that the information carried by the elements can be preserved and interpreted by archaeologists for years to come, even if the physical paintings and drawings cannot be preserved. Joining us for the project to learn the technique were Sarah Brewer, a local archaeologist who grew up in the area, and Jairo Avila, a graduate student studying archaeology at Cal State Northridge who plans to write his thesis on the paints used on rock art sites in Southern California. Developed by Cultural Heritage Imaging (CHI), RTI is a way to create a digital image of a flat surface that when processed with special computer software, allows the texture of the surface to be examined using a moveable virtual light source. Special filters can also be used to emphasize the surface features, as well. Students in our class learned how to set up the camera and special equipment to capture images in the fall of 2011, when the staff of CHI taught a workshop at the Getty Villa. The set-up involves placing a camera on a stable tripod in a position allowing the desired image to be framed and in focus. Two small, black, shiny reflective balls are also placed in the image, attached to long sticks that are held steady by tripods. A series of 24 – 72 images are taken with a bright light source such as a portable flash in a different location each time, while the camera stays in the same position. Afterwards, the images are fed into a computer program that recognizes the location of the highlight on the shiny black balls from the flash. It uses the information to calculate the direction and distance of the light from the object in each image, adding them together to make a single image (without the balls). When the image is viewed on a computer, the viewer can use a mouse to move a virtual light source, showing the highlights and shadows of the surface from different angles. This technique is especially good for documenting rock carvings that might not be easily visible with normal lighting. We had never carried out RTI in an outdoor setting before, and were met with some challenges. The first was hiking with all the equipment out to the site! Another issue was the brightness of the mid-day sun, which can sometimes cause problems with trying to use another light to create shadows. This wasn’t as much of a problem as we expected though, because the rock face happened to be in shadow itself, allowing the flash to do its job. We made up for the extra light by taking the images with slightly shorter exposure times. Another problem was that we did not have enough tripods. We solved this problem by picking up some dried yucca stalks lying on the ground, mounting the balls on the ends with plastic ties, and propping them up with our backpacks and small rocks lying on the ground nearby! We were quite proud of this innovation. It was a beautiful day to be out in the park admiring the rock art, and we can’t wait to go back! Categories: Documentation | Tags: documentation, rock art, RTI | Permalink. Conservators are always looking for new techniques that will aid in the examination and documentation of art. 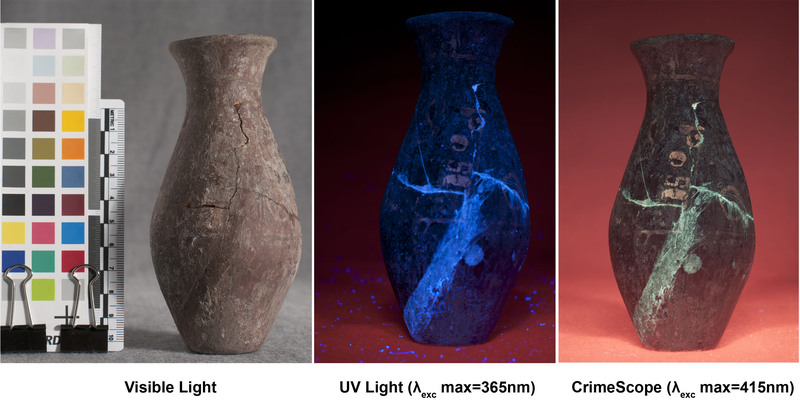 The UCLA/Getty Program purchased a forensic light source, the Mini CrimeScope (from Horiba Scientific), to investigate its application in conservation. The CrimeScope is an alternate light source used by crime scene investigators to look for blood stains, latent fingerprints or any other forensic evidence they could utilize for solving crimes. The wavelength of the emitted light in the CrimeScope is controlled by filter wheels that allow material to be examined from ultraviolet to infrared. Instead of solving crimes, students in the conservation program have been using it to solve archaeological mysteries through the study of ancient and ethnographic objects. Artifacts analyzed include pre-Columbian ceramics and polychrome African wooden masks. They have been using the light source to look for evidence to answer questions about materials, technology and manufacture of artifacts, areas of deterioration and signs of previous conservation interventions. Our CrimeScope has also been used by colleagues at the J. Paul Getty Museum to look at the faint remains of a drawing on a white ground lekythos. The CrimeScope is being employed to compliment other techniques of analysis and provide a first screening during the examination of materials. With the use of a forensic camera and a series of different camera filters the students have also been able to record the fluorescence and luminescence of materials and to see beneath their surface. The results are remarkable and we are currently exploring other potential applications of our CrimeScope to investigate and document different archaeological and ethnographic treasures. Categories: Det. & Conservation of Ceramics & Glass, Documentation | Tags: CrimeScope, documentation, examination, forensics, light source | Permalink.